Up for grabs - BATMAN #59, Featuring the first appearance of Deadshot (Floyd Lawton), founding member of the Suicide Squad! 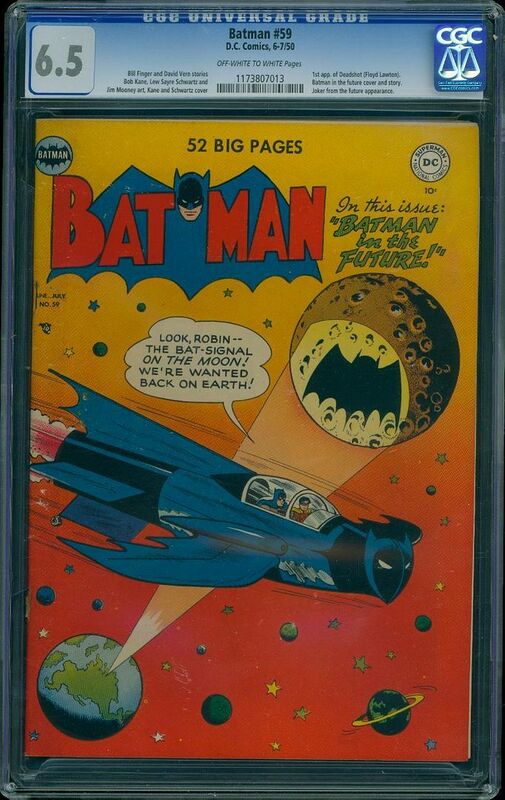 This book is CGC graded as 6.5 (FINE PLUS) with a Blue (Universal) label, meaning the book is completely unrestored! Book also has a near perfect off-white to white page quality!! PLEASE LOOK AT HIGH RES SCANS TO SEE THIS BOOK FOR YOURSELF! PER THE CGC CENSUS THERE ARE ONLY 21 (TWENTY-ONE) COPIES GRADED HIGHER THAN THIS ONE!! Bulletproof Packaging, Shipping/Handling and Full Insurance is all included anywhere in the United States. International buyers - price is typically $50-$60 to Canada, $60-$70 to the UK, and up to $85/$90 to the Far East. But I ship with full insurance! Time payments are available for books over $1,000 if needed (must be discussed). And several references can be provided upon request!! Thanks for looking and be sure to add me to your favorites list!